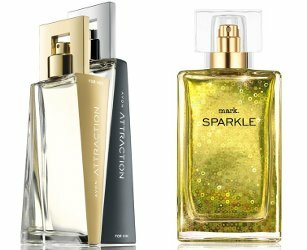 Avon has launched Attraction, a new fragrance duo sharing a "magnetic musk accord", and the brand's youth-oriented label, Mark, has launched Sparkle, a new fragrance for women. Avon Attraction for Her (above left) ~ "Designed to draw you closer together, this magnetic, woody fruity scent of Avon Attraction brings hour after hour of undeniable attraction. Captivate their senses with tempting blackberry, magnetic musk accord and vanilla amber." In 50 ml Eau de Parfum. Avon Attraction for Him (above left)~ "Draw closer with intriguing new fragrances for hime [sic] and her that captivate all night long. Irresistible ginger root, magnetic musk and smoky woods." In 75 ml Eau de Toilette. Mark Sparkle (above right) ~ "Dance. Toast. Celebrate. Let the fun begin with this dazzling blend of flirty strawberry, pink jasmine and addictive chocolate essences." In 50 ml Eau de Toilette.